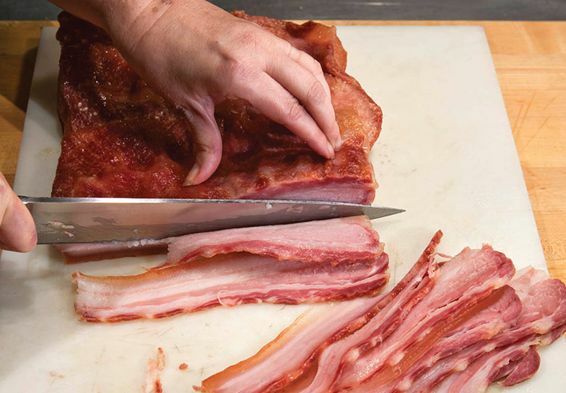 Say goodbye to store-bought bacon, said Kate Krader in Bloomberg.com. This do-it-yourself recipe is “supremely easy,” requiring only three or four ingredients and no special equipment. Just rub the seasoning mix on slices of quality pork belly and within three days you will have flavorful, nitrate-free, pancetta-like bacon. For a smoked flavor, sub in some smoked salt, or cook the bacon in an indoor smoker or on an outdoor grill. • Mix the salt, sugar, and pimentón (if using). Rub three quarters of the mix into the belly’s meat side and the remaining quarter into the fat side; rub it in around the sides of the slab too. If using black pepper, pat into the fat side before adding the salt-sugar mixture. • Seal the belly in a zip-lock bag, pressing the air out. Refrigerate for three days, turning each day (liquid will collect in the bag; don’t pour it out).